In commercial applications our cost is in line with the average cost of our local competitors who change out box pleated filters. We are finding that our pricing is generally 20% less than our competition on rooftop work. Why should I use your electrostatic filters rather than store bought filters? Electrostatic flitration can be configured to your exact needs. We can combine different types of media to produce higher filtration or lower resistance. "One size fits all" filtration doesn't take into consideration that a computer room may need higher filtration than a lobby. Our filters are made of high quality material and to rigid specs that you won't find in retail stores. With our service we take responsibility for your filters. You will never have to buy another filter again. Most importantly we have the technology to thoroughly clean the filters each time and bring them back to a like new condition. There is no waste, no hassle, and no time consuming maintenance. Do you sell electrostatic filters? Yes, we can build filters to your exact measurements. However without using our service you will have the burden of cleaning them yourself which is a primary advantage of our service. In the years before Sonitx began cleaning electrostatic filters many companies, including some local governments, saw the environmental benefits of cleanable filters and ordered thousands of them only to find that without the proper cleaning technology the filters clogged and became worthless after a period of time. We, at Sonitx, provide an economical alternative to having your staff spend hours upon hours cleaning filters. Will your filters help my allergy? Some of our customers report very significant decreases to complete elimination of allergy symptoms and some customers report little change when the home or office has lower quality windows and doors or construction that allows a lot of outdoor air into the home or office. How often do you service the filters? Our services are monthly, bimonthly or quarterly depending on the actual weight of the filters during the heavy months. For example, assume that you have a 20x30 filter that will accept 160 grams of dust before impeding air flow. If, after two months of service during the locally heavy months, (July-September in the Las Vegas area) your filter only has 15 grams of dust, then we would advise you that you can safely go to the quarterly schedule. Absolutely. We will send a team to your location for exact measurements and can have a quote either on the spot or within 24 hours. 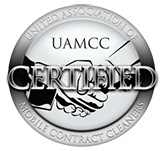 Certification from the United Association of Mobile Contract Cleaners.